Fibreglass Roofs do not set properly below 2.5% it is essential that fibreglass roofing is installed in the correct weather conditions. Another major factor is rain we always check the forecast prior to commencing any fibreglass installation. The fibreglass resin itself which must be at a certain temperature before application. Firstly the old roof covering must be completely removed to ensure a smooth application. 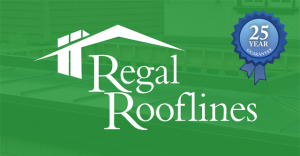 Regal Rooflines replace the existing boards in order for our contractors to proceed. It is essential for our contractors to complete this boarding process in a dry environment as timber rapidly takes on moisture. This can lead to imperfections in the joins of the roof which in the long term undermines the structure as a whole, It is also imperative that these boards are laid at the correct angles with concise, uniformed spaces between them. To stop pooling and standing water Regal Rooflines will create a drainage channel. Sometimes this is not possible due to any one of a number of external constraints; it may be the case that a slight elevation is added to the roof in the above boarding phase. At this stage a thorough check on all works carried out up until this point is carried out. Particular focus placed on the spacing of the boards and adjoining walls. This is to ensure that the up stands and trims fitted at this point create a robust watertight seal, once satisfied all is in order Regal Rooflines will fix the Boards to the joists of the roof. This phase effectively ensures the longevity of the roof. Up stands are secured and roof trims are in place our contractors now begin taping all joins and trims the purpose of the taping process is to proof the roof against fractures and cracking further down the line. The tape used is not ordinary tape but glass tape, Firstly a small amount of the Scott Bader fibreglass resin (essentially the same material used in the main lamination stage) is rolled on all joins. The glass tape is then applied, once applied a further layer of resin is rolled into the glass tape. Once the previously taped layer has set the main process of laminating can start. The time the taped layer takes to set is variable and dependent on the weather conditions; the conditions on the day also influence how much glass is laid in each layer or “mix” Firstly the glass must be cut to size, resin mix is then swiftly applied to the first area of the roof to be covered, the glass is then rolled on top of this mix. The rest of the first batch of resin mix is applied to the top of the glass this is then left to set. The final step is a thorough rolling to remove trapped air or imperfections. This process is then repeated culminating in the fully installed roof. The main laminate will take the best part of a morning or afternoon to cure again dependent on the weather conditions on the day. Once our contractors are satisfied the setting or curing process is complete, it is time to move on to the next stage of your fibreglass installation. It is important at this top coating stage that continuity is achieved in terms of the resin mix, as it must be the same as the resin mix used in the previous stages of taping and main lamination. The topcoat is applied quickly yet carefully normally with a roller or brush it is important to achieve a consistent depth or thickness of top coat across the roof. Again care must be taken to ensure the top coat is neither too thick nor too thin. To achieve the desired finish the whole roof area must be top coated thoroughly. Not only were we delighted with the high standard of the work done, the very competitive price and the quality of the materials used, we were extremely pleased (and having experienced other building companies in the past, rather surprised) by the polite and considerate way the work on the site was carried out. The workmen did everything they could to minimise the disruption to us while they were on site. Another thing that impressed us was that they kept us fully informed throughout the process. With their quote, they attached a full explanation of their work methods, the materials they would be using and the guarantees that would be given for the work. We were consulted on any slight variations that became apparent during the work. Throughout, we felt that we knew what was going on and were happy that there would be no unpleasant surprises at the end. Flashing must firstly be inserted into pre prepared slots this is then secured with polyurethane glue finally silicone is applied to the length of the flashing to finish. The Fibreglass roof is now finished, dependent on the weather conditions the resin can take anywhere from a matter of hours to several days to set or “cure” it is absolutely essential that it is not walked on during this time. Avoid using any harsh chemicals to clean your roof want to know more about Fibreglass Flat Roofs in Kent?